If you've been visiting this week, then you know it's been all about some DISNEY FUN for me (if you haven't been visiting, I hope you'll stick around to snoop out my Mickey-themed projects -- I made a Mickey Hat Transformer Explosion Box for the Disney/Pixar Hop this past weekend (see it HERE)... 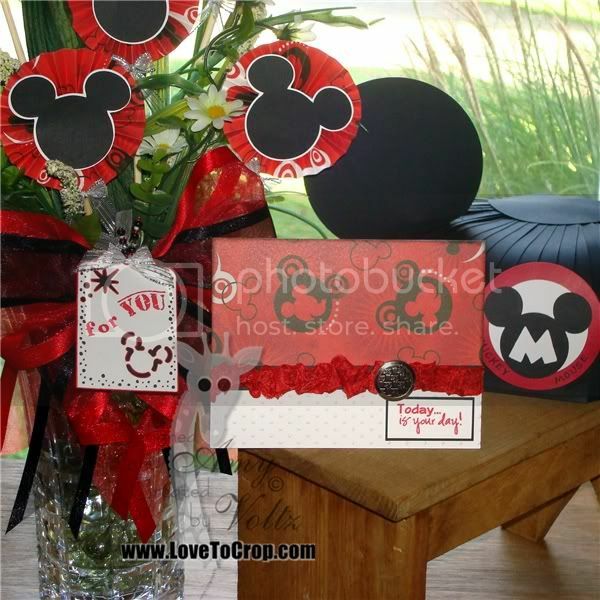 I Mickey-ed up a flower arrangement with some Mickey rosettes for the Disney/Pixar Decorations and More Link Up Challenge yesterday (see it - and LINK UP - HERE )... And today I'm entering my card in the Disney/Pixar CARD Link Up Challenge over at Disney Dreamer Designs!! WOW!! It's a week-long celebration of our favorite DISNEY characters -- And YOU can join the FUN (and WIN some MAGICAL prizes too!!)!! For EACH thing you do (you don't have to do them all, just as many as you'd like for chances), be sure to leave me a separate comment because you get one chance for EACH completed step (plus the bonus chances if you make a purchase -- remember to add that note as I will have Julie let me know when you order!)!! I will keep this GIVEAWAY open until October 7th for those of you who want to order on a PayDay... I will choose TWO winners for this GIVEAWAY!! Woot-woot!! Really girl . . . when do you sleep? You totally amaze me! 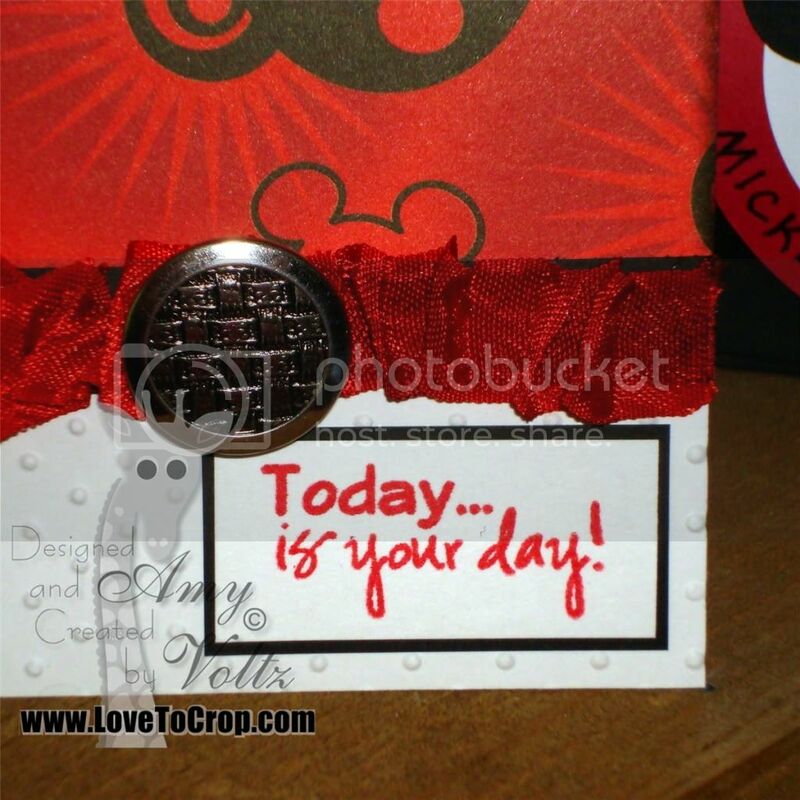 I love this card, and the ribbon and the button . . . love it all! Thanks for joining the Disney Pixar Link Up Party! Amy, your card is awesome. The whole "party pack" is phenom!!!! wow, that was a mouthful.lol. I had heard about their ribbon, so I went over to their page and became a follower, I especially love the Harvest bundle. The ribbon is gorgeous. What a great Mickey card. What a fun hop that was to. I love the ribbon you used it is perfect for the challenge. Wow Amy, I love this Mickey card. You do such great work. I did all of the above. I can't wait to try out some ribbon. I think I might have to get together with my girlfriend and order some. I like the set with the sunflower color. This is super cute and such a fun hop!! You always have such cute projects!! TFS! I am following 3 Girl Jam. Love the Spooky Colors bundle especially the purple. I follow 3 Girl JAM. My favorite bundle is the Harvest Bundle. Love those colors. This is my 2nd extra entry for a purchase. Her ribbon is beautiful, can't wait to get it. LOVE the bundles!!! Hot and Cold is my fave I think, although the winter one would be great for holiday cardmaking :) thanks for the chance! HI AMy- Im already a follow of yours and a fan on fb, I like the winter bundle! 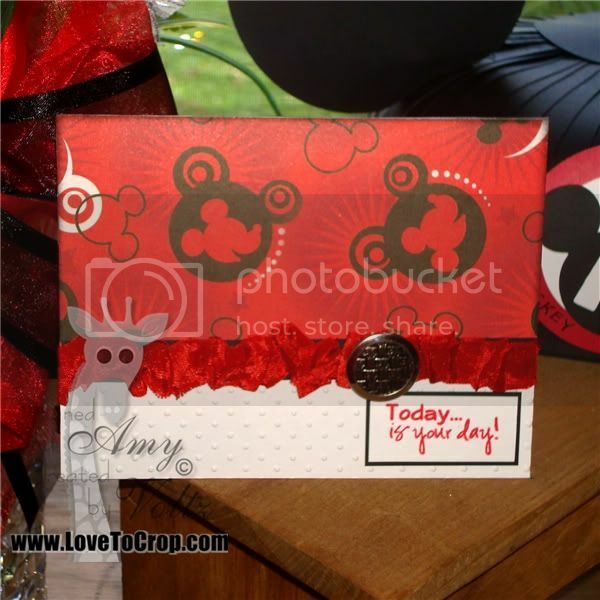 Super cute card and I LOVE that ribbon! Thanks for playing with us at CTO! I'm sure I already follow your blog. Love your Micky themed projects Amy!! They all came out spectacular! Thanks for joining team 2 this week! You did such an amazing job with all the party decorations. Of course I love this card and that ribbon is the perfect touch. Hi Amy! You won the prize over on my blog, but I didn't have your email address to get in touch with you for your mailing address. If you can email me at jamielanedesigns@gmail.com with your mailing address and phone number, I can get your prize out to you! very cute, I love your Mickey projects. TFS! Love your card!!!! I am ordering some of that ribbon as we speak!!! Wow, what a great card. I love that ribbon at the bottom. what fun this bouquet and card would be to receive! I am loving all your Disney-inspired creations!! You are so talented!! Just stopping by from Getting Cricky Featured Blogger Thursday to see if I missed anything...I may have already said this, but all of your Disney creations are fab! Great job.......I love everything. I am commented and was told to say is for Getting CrickyFeature Blogger Thursday. I also comment on the Sunday blog challenges yesterday. I am a fan of all the DT and Kristals. Stop and visit me I have post my card for the challenge. As usual Amy, you know how to celebrate the occasion, I love it all!!! Oh how I have missed your inspiration and the cheer you bring with you when posting! I can't wait to get all settled in to get back my loyal follower status back lol.. Hoping you are having an incredible weekend and that your weekend is just as blessed! Huge hugs! Love how you did your ribbon! Thanks for hanging out with us this week! Love the Disney! great card! !